The VOR (VHF Omnidirectional Range) Simulator was designed to demonstrate the approximate indication that a VOR would display with varying positions of an aircraft in relation to certain navigational facilities. Select desired Navaid type and settings. Drag aircraft on horizontal or vertical panels to change the aircraft's position in relation to the facility. 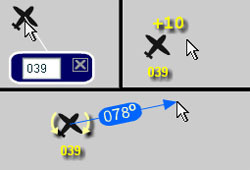 If North Up is selected aircraft heading changes can be set by positioning the cursor close to the aircraft on the horizontal panel then clicking the button when a "-" or "+" appears. 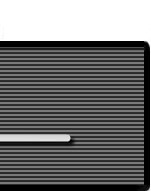 If Heading Up is selected, aircraft heading changes can be set by positioning the cursor close to the navigational facility on the horizontal panel then clicking the button when a "-" or "+" appears. 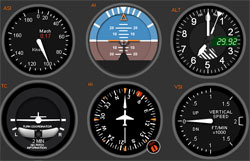 as the compass rose symbol on IFR en route charts to show direction in relation to the magnetic north. To or From depending on where the aircraft is positioned. Show OBS CRS To / From - Shows a line indicating the direction of course "To" (blue) and "From" (green). versa. The movement is made in alignment with the projection flags. 1. For the glide slope feature. you to determine its influence and consequently the error associated to it. with certain types of facilities. Settings Section - Select and activate different feature such as setting wind, viewing wind triangle, zooming map and more. Other Settings Section - Contains additional settings such as the holding pattern template. Navaid Information - Displays information such as radial, OBS setting, and more. *Please note that DME may not be present together with localizer, back course localizer, LDA or SDA approaches. The DME distance shown is the approximate value a DME would indicate if such navigational facility were collocated. CAUTION: The behavior of the VOR and other information displayed is approximate for illustration purposes only and may not reflect the actual readings on the VOR and DME.